We caused quite a stir in February with our sneak peek of this unique swimwear label for men and boys, unveiled at Kids Instyle Sydney. You’ll be thrilled to know the brand has launched, so prepared to get all loved up as we show you the latest beach threads, which have cornered a whole new section of the mini-me market. We’re understandably keen on mini-me apparel, but generally it tends to be more “mummy and me”- like the sunny swimwear from Stella Cove. 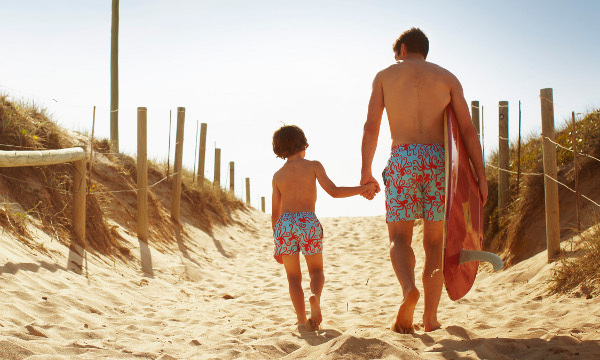 Here’s a welcome turn up for the books – a “daddy and me” range of boardies. Tom & Teddy comes from a couple with two boys, who spied a gap in the market and dove straight in. If I could sum up Tom & Teddy swimwear in one word, it would be “vibrant”. You won’t see colour combinations that are insipid or safe – or traditionally male. If you’re a mum of boys like me, you can get your fix of pink with the Rosebloom shorts, or the pink and brown turtle boardies. The shorts come in block colours (which again are a departure from the ordinary), from Tomato to Nasturtium and everything in between. The patterns are surprising, in that they translate well from the kids’ shorts to the men’s. My hands-down favourite is the Octopus – in the red and blue combination. But there are also penguins, fish, turtles and salmon. 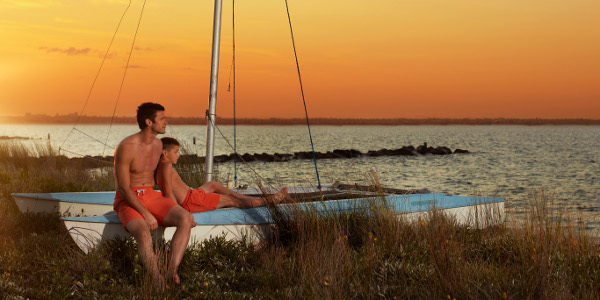 The shorts are made from quick-drying microfibre, and are saltwater and chlorine resistant. The boys’ shorts fit kids from the age of one through to ten, and start at $44.95. The men’s shorts range in size from extra small to extra, extra large, and start at $74.95. Orders can be made directly through Tom & Teddy.